While European politicians demonise and scapegoat refugees, many ordinary citizens are extending support and solidarity. Lily Sparks reports on the work of La Plateforme in Brussels. When I first came to Park Maximiliaan, in the summer of 2018, I was caught entirely off guard. Months of volunteering on the ground in the remnants of the Calais Jungle refugee camp did not prepare me for this. 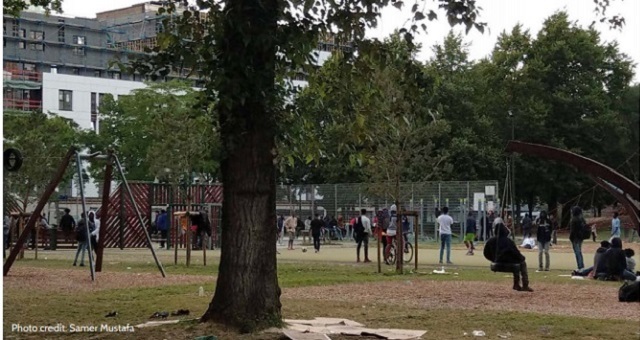 A park full of people of colour, not shunted to a distant, hidden camp but in the heart of a European city, surrounded by a predominantly white population dressed in business clothing going about its daily business in the high rise office buildings around it. Across the park, groups of people sat on sheets of cardboard, or played football, or tried to wash their clothes at the park’s single tap, beside the climbing frame. As temperatures grew colder — and summer turned into winter — conditions in the park and station deteriorated further. People lay in piles of blankets and sleeping bags in the middle of the day, trying to sleep; rows of people rested on cardboard sheets lining the station; a makeshift barrier between the cold floor and their sleeping bodies: children as young as eight, women, teenagers, men. The police routinely swept the station, arresting and searching people seemingly at random, using cable ties to cuff hands behind backs. I soon came to realise, however, that amongst all this desolation, the park and station are also places of great hope. Every single day a variety of organisations convened at both sites to try to provide food for the refugees. They are often overwhelmed and run out of provisions, but this is effectively the only access to food refugees have in the city. Every evening, at 8 o’clock, a post goes out on the Facebook group “Plateforme Citoyenne de Soutien aux Réfugies Bruxelles” calling on its more than 40,000 members to help the people in the park, who had been abandoned and forgotten by the city and desperately need a safe place to sleep. Every evening, a small group of volunteers convenes and begins the arduous process of connecting those willing to host with those looking for a bed. This process can last hours, and a bed is not always guaranteed for all. Nevertheless, the “family houses” (as they are known) are sites of hope in an otherwise depressing situation. Many open their homes and what this produces is often nothing short of beautiful; children play as meals are made and shared, stories are told, films are watched and endless rounds of UNO are played. Every single one of these refugees has left their own families behind, and has since lived the well-documented, yet well-ignored, horrors of Libyan migrant camps. Every one of them placed their lives at the mercy of the perilous Mediterranean crossing, in the hope of reaching a safe place free from military conscription, repressive government and war. It is this solidarity, in such contrast to the uncaring response of European governments who continue to fortify borders and use refugees as scapegoats, in order to further their own political agenda, which has left me truly in awe. Every night, La Plateforme now provides up to 300 people with a bed in a volunteer-run accommodation centre, and lodges around 200 more in private host families. This is people helping people, showing and not just saying, in the face of inhumane politics, that they care. It is the most radical of acts: to acknowledge your position of privilege and extend an arm to those who, however different their backgrounds and circumstances, are above-all fellow humans in need. Everyone is an individual, no matter how hard Europe insists on treating them as mere statistics. And away from cold station floors and frosty park benches, this fullness of individuality soon emerges. Mohammed will always be the first to help with the washing-up, Abdal’s idea of sweetness make for consistently over-sugary tea; Samuel will always ask “what’s wrong?” even when you thought you’d hidden your sullen mood well. I am lucky enough to call so many of them my friends. On a chilly day last December, extreme right-wing politicians organised a march against migration which saw thousands marching through Brussels “in defence of their Belgian identity” and “against the threat of outsiders”. La Plateforme managed to empty the park in less than half an hour, after the marchers had made explicit threats of violence against the refugees. Whilst those who marched chanted about “closing the borders”, of “keeping people out”, the park’s refugees largely spent the day with their hosts across the city. People helping people, the promise of a movement that, on that day and every day, is showing that solidarity is stronger than hatred. Brussels’s migrant solidarity network is an example of how people can help impact the lives of others, and how supposedly insurmountable differences are largely fictions. If every single person in a privileged situation took responsibility, however small, for helping others, imagine how radically different the world could be. Lily Sparks spent more than a year working in humanitarian aid in Calais and Brussels after finishing her studies.